Fiber reinforced polymer (FRP) composite materials are making an entry into the construction market in both buildings and pavements. The application to pavements so far has come in the form of joint reinforcement (dowels and tie bars). FRP resistance to salt corrosion in dowels has made it an alternative to standard epoxy-coated steel dowels for pavements. Iowa State University has completed a large amount of laboratory research to determine the diameter, spacing, and durability of FRP dowels. 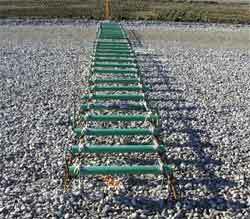 This report documents the performance of elliptical FRP dowels installed in a field situation. Ten joints were monitored in three consecutive test sections, for each of three dowel spacings (10, 12, and 15 inches) including one instrumented dowel in each test section. The modulus of dowel bar support was determined using falling weight deflectometer (FWD) testing and a loaded crawl truck. FWD testing was also used to determine load transfer efficiency across the joint. The long-term performance and durability of the concrete was also evaluated by monitoring faulting and joint opening measurements and performing visual distress surveys at each joint. This report also contains similar information for standard round, medium elliptical, and heavy elliptical steel dowels in a portion of the same highway. In addition, this report provides a summary of theoretical analysis used to evaluate joint differential deflection for the dowels.